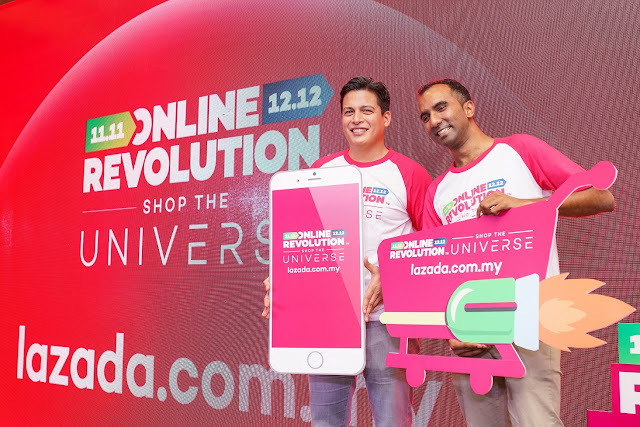 Lazada Malaysia today launched its biggest shopping event of the year– the Online Revolution 2017. Running for its sixth year, the month-long online shopping extravaganza will take off on 11.11 (11 November 2017) until 14.12 (14 December 2017) and will feature 90 million products with savings of up to 90 per cent. Themed “Shop the Universe”, Lazada Malaysia introduced new sections in 2017 within the Lazada website to provide Malaysians with access to an even wider range of assortments with attractive prices. These sections include “Digital Goods” that cover Lazada e-vouchers, Petronas Gift Cards and travel packages, “Official Stores” with over 1,000 brands like Estee Lauder, Clarks, Senheng and L’Oréal, and lastly “Taobao Collections” that include curated and products from top Taobao China Sellers. Besides that, shoppers can also look forward to exciting brand flash sales, items as low as RM1 while brands like Nivea, Durex, Maybelline, Mattel and Laneige will be providing Lazada customers with “Mystery Boxes” for them to enjoy further markdowns. Hans-Peter further explains that this year’s Online Revolution is a reflection of the company’s commitment in continuously providing its customers with a seamless shopping experience. “It is in our nature to expand and evolve alongside our customers’ needs and that is why we have tripled the offerings from last year. By putting the “Universe” at the fingertips of our customers, we are addressing every aspect of online shopping that are important to our customers including affordability, assortment and convenience,” he concluded. Online Revolution will be joined by various marketing partners including Digi and CIMB, and will feature giveaways worth more than RM 60 million, including Club Med holiday packages, Go Pros, iPhone Xs, Perodua Bezzas, a chance to experience Zero-G and many more!